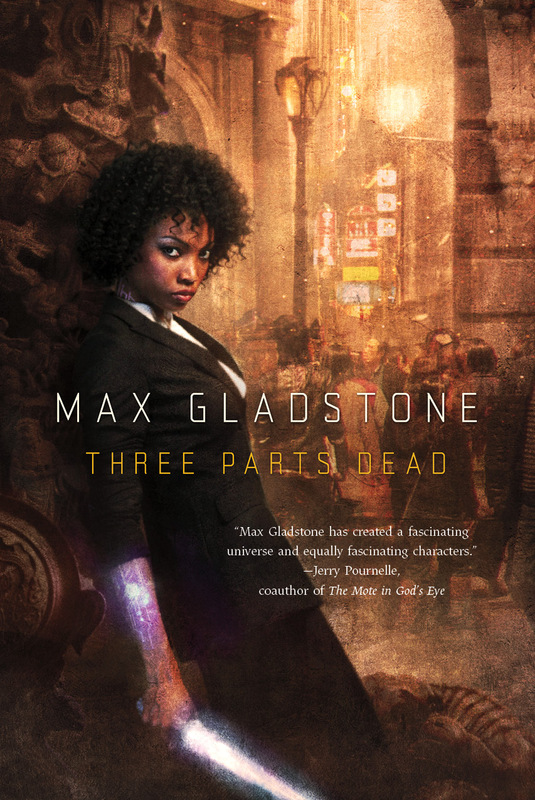 Since I’ve been more active in the SFF blogging community, one of the books that I’ve heard about constantly has been Max Gladstone’s Three Parts Dead. Those who had read it couldn’t recommend it enough, and those who hadn’t read it had placed it in a high-priority spot on their TBR. I’m happy to say that I now belong to the former group – those who cannot contain their love for Gladstone’s world and characters. Three Parts Dead takes place largely in the city of Alt Coulumb, one of the last cities protected by a god. In Gladstone’s world, gods and goddesses live among mortals (and other creatures); the number of these deities has decreased over the last century as a result of the God Wars, fought between the magic-wielding Craftspeople and the gods. Alt Coulumb was especially affected by the wars, as their goddess Seril died fighting. The remaining god in Alt Coulumb is Kos Everburning, a fire god whose power fuels the city. But somehow, despite all odds, Kos Everburning has died. The city of Alt Coulumb is defenceless and soon its steam-powered economy will collapse. That’s where Tara Abernathy comes in. She’s a Craftswoman who’s recently joined the legal firm tasked with carrying out the fallen god’s contracts. Using their magic, Tara and her boss Elayne must attempt to preserve Kos’s body as evidence for the courts, and possibly even raise him from the dead. Gladstone’s world building is incredible, as he reinvents common portrayals of the divine, magic, and necromancy in order to create something wholly original. Tara and Abelard aren’t the only people trying to solve the mystery of who killed Kos Everburning: they are also joined by Cat, Abelard’s friend and a member of the aforementioned police force controlled by Justice. When she’s on duty, Cat puts on a suit and is controlled by Justice, the blind and impartial force that ensures the city’s laws are upheld. Unfortunately Justice isn’t really blind, as Gladstone suggests that even goddesses have their weak spots, areas of prejudice that they cannot overcome. I won’t spoil it for those who have yet to read Three Parts Dead, but let’s just say that Justice really has it in for the Stone Men. Much like Justice, Cat also struggles to overcome her weakness, an addiction to vampire bites. Essentially the heroin of Alt Columb, vampire bites allow Cat to transcend the emptiness that she feels when she’s not wearing the suit and connected to Justice. But like all drugs, the bites only work for so long before Cat must confront her real problems. While the mystery of who killed Kos Everburning is compelling and Gladstone’s world-building is fascinating, it’s really his characters that elevate Three Parts Dead. It didn’t take long until I had come to care about Tara, Abelard, and Cat, to worry about their failures and fist-pump at their triumphs. I loved them all, but I had a soft spot for Tara. Her steely determination to uncover the truth, coupled with her cool intelligence and thirst for revenge made her a character worth rooting for. If you haven’t read Max Gladstone’s Three Parts Dead you’re doing yourself a major disservice. Pick up a copy so we can all share in the flails! See, the nice thing about being way behind on a series is we have two books to look forward to in the series. Race you! So glad you loved this book! Welcome to the Max Gladstone club:-) And the other two books are so different from this one and each other–but they have the same level of awesomeness. Now you can read them back to back if you want to! I’m definitely a member of the Max Gladstone fan club now! As much as I loved Three Parts Dead and all of its characters, I’m looking forward to discovering more of the world that Gladstone’s built. Bring on book 2! Okay, you win. This is my next new (to me) UF read. I just downloaded it to the kindle for reading.<—–true story. YES JESSICA! You will love it. I just picked up Skinwalker by Faith Hunter and saw on GR that you gave it five stars…much excitement! I can’t say enough good things about the world building! Max Gladstone is definitely one to watch. YOu described Alt Coloumb so well! I am so glad you decided to read this one. I loved it and the second book and I actually just finished the third. Thanks! I loved the city so much – not sure I’d want to live there. Can’t wait to hear your thoughts on book 3!